Two people were seriously injured after a car went off the road on King Street East, hitting the Tim Hortons near the intersection with Drew Road. The two women hit by the car are in hospital in stable condition. Police are looking to find two people they say were in the area at the time of the incident. Two women were seriously injured after a car ran into a downtown coffee shop. Shortly after 1:10 a.m. on Sunday, May 29, police responded to a collision near the intersection of Drew Street and King Street East. 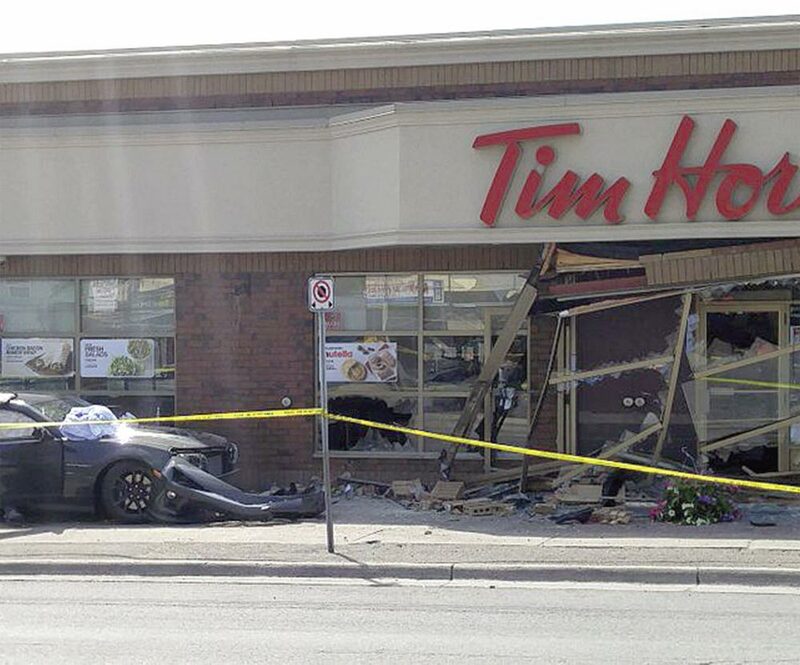 According to police, witnesses on the scene reported seeing an eastbound Chevrolet Camaro go off the road and hit the Tim Hortons next door to Victory Cigars, destroying the glass foyer on the north side of the building. A 25-year-old Whitby woman and a 19-year-old Ajax woman were leaving the store at the time, and were hit by the Camaro. Police say one of the women was pinned against the building, and was freed after a passing tow truck helped dislodge the vehicle. Both women were rushed to hospital with serious injuries, and remain in hospital in stable condition. The driver and passenger in the car were uninjured. A 59-year-old male of Clarington has been charged with two counts of dangerous operation of a motor vehicle causing bodily harm. Police are seeking two individuals they believe were witnesses to the incident. The first is the driver of a pickup truck that was also heading east on King at the time of the crash, while the second is a patron of the coffee shop who arrived on an electric scooter just before the crash. Anyone with information regarding this incident is asked to call Det. Const. Lee at 1-888-579-1520, ext. 5231.